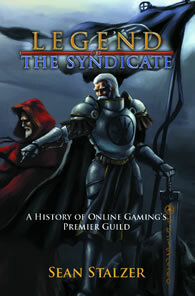 The Syndicate was just awarded a new Guinness World Record for “continuous operation” as an Online Gaming Guild. 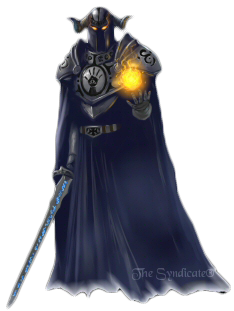 The new record reads “With a documented history stretching back to at least February 1996, The Syndicate (www.LLTS.org) is the longest-running online guild, with 17 years, 8 months, and 26 days of continuous operation as of 28 October 2013.” and can be seen online at the Guinness World Record website: http://www.guinnessworldrecords.com/world-records/8000/longest-running-online-gaming-guild. Although set back in October of last year, it takes many weeks to get through the detailed Guinness review process of the evidence to award a new record so it was just awarded in March of 2014. For The Syndicate, setting this record is special for a number of reasons. It represents an achievement that is statistically extremely hard to accomplish in the online gaming space. Guilds, in general terms, are so fleeting and so tenuous that surviving a year is a big accomplishment that any community should take pride in. Surviving 5 years is virtually unheard of. If you survive a decade then you are among the oldest guilds that exist. Surviving and thriving for over 18 years is so rare its useful to compare it to things we all know the ‘odds’ of happening a bit more clearly. By our conservative estimation, close to 66,000,000 guilds have been created and have ceased to exist. The real number is likely much higher but using that as a baseline, and knowing the odds of being struck by lightning, if you live in the United States are about 1 in 1.1 million, then you are about 59 times more likely to be struck by lightning than to be in a guild that lasts over 18 years. You are about 5 times more likely to be attacked by a shark or to become President of the United States. So, from an ‘odds’ standpoint, this record is a big deal to us because of the rarity. 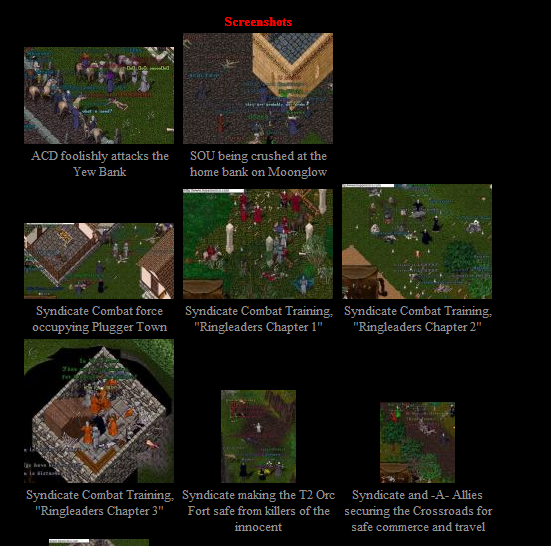 Some of The Syndicate’s earliest activities in Ultima Online. At its core, however, the record represents this guild’s inner friendships and unity as a team. Although some troll will chime in saying “that can’t be true!” The Syndicate has virtually no turnover of people quitting our guild to join other guilds.. or because they were kicked out for breaking rules.. or because they are unhappy in the community. The Syndicate had developed a very stringent and detailed recruiting process many years ago. Through that process, they recruit like minded people with similar goals and expectations. As such, they lose very few people (only 1 or so per year) to those kinds of reasons. Because of that, members stay in the guild for many years and as such build very deep and lasting friendships. Those friendships create a very strong sense of community and a very tight unity among a very large team. Despite having many hundreds of members, The Syndicate members have played together for a very long time and thus a very stable series of bonds have formed. For this guild, the GWR represents that success because they do not have drama and infighting and thus do not implode and cease to exist. In short, achieving another Guinness World Record is not just about existing another year. Its about the continual evolution of our community model and the continued growth of friendship. 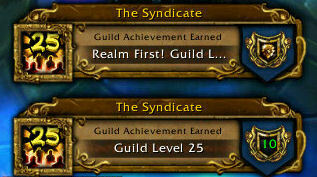 The Syndicate becomes the first Guild of their realm to reach Level 25 on April 04, 2011 in World of Warcraft. Setting the GWR for “oldest guild” is not without its controversy however. In response to this posted news article there will almost assuredly be someone who posts a note saying their guild.. or some guild that they heard of or that their brothers friends cousin created… is older. Therein lies the issue and that issue is one of proof. Proof of exactly when the guild was founded. Proof of continuous, uninterrupted existence under the same name for its entire duration. When The Syndicate set the initial record, a mountain of proof had to be supplied. Proof is NOT a website or a personal statement/attestation. Proof has to be independent third party sources. The evidence then has to be numerous enough to stretch the entire lifetime of the organization; show uninterrupted operation under the same guild name; and stand up to an independent, third party review. In short, it is a very high bar to meet with a great deal of detail required and a huge amount of scrutiny applied to the proof. The entity may have been founded before Feb 1996 but at some point in its history it went dormant (i.e. was not an active community and actively engaged in online gaming) for a period of time, which violates the “continuous” part of the record. The entity may have changed names throughout its history which means it really isn’t the same entity. Its a new guild formed by some of the members of a defunct guild. The entity really has no evidence other than statements, memories of the good ole days and a website. Memories are very flawed things so without strong, third party, auditable evidence our memories don’t count for much. Things like magazine articles, articles of incorporation, being featured in movies, writing and publishing books, trademarks and things like that are all good pieces of evidence. And then having enough of them to cover every single year is critical. All of that said, regardless of where you come down on the issue of “my guild is older!” there is a value added proposition for all of MMO Gaming with the setting of a new World Record. The record brings a little more attention and a little more positive focus on the Online Gaming Universe. More positive focus benefits everyone in the community and it helps ensure there is a vibrant universe of gaming options available for all of us for many more years to come. Editor’s note: A special thanks to Sean “Dragons” Stalzer for bringing this to our attention. Congratulations and may The Syndicate last for many more years! LLTS!